Trade unions in Turkey have been holding a one-day strike in protest at the country's worst mine disaster, which has claimed at least 282 lives. Thousands took to the streets in cities across the country, with clashes breaking out in Izmir. President Abdullah Gul visited the scene of the disaster in Soma, as Turkey holds three days of mourning. The first funerals of victims have been held in a crowded town cemetery, as excavators dug new graves. Meanwhile a survivor of the disaster described what happened. Media captionRescue worker Ugur Acar: "There is water mixed with coal dust coming up to your knees, it feels like wet cement"
"We smelt the smoke and we went upstairs and heard the explosion," Ferhat Ay told the BBC. "I went back down to rescue my friends. I couldn't breathe. I couldn't go back." 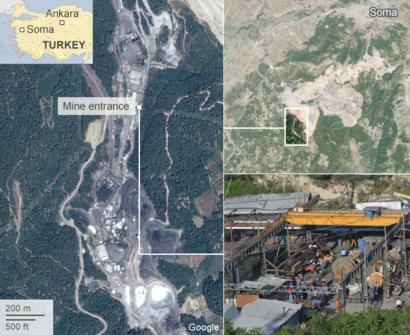 Harrowing stories about victims continue to emerge, with Hurriyet newspaper reporting a note found in the hand of a dead miner which read: "Please give me your blessings, son." Excavators have been digging new graves in the town's cemetery, as funerals are held for victims in quick succession and loudspeakers broadcast the names of the dead. Women cried and sang improvised songs about their relatives as the bodies were lowered into the graves. 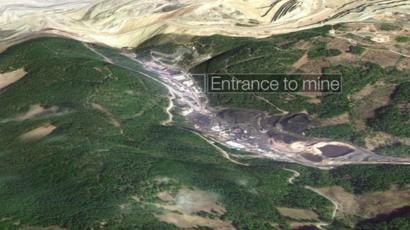 Rescue efforts continue at the mine in Soma but there is little hope of finding anyone else alive. Eight bodies were recovered overnight, bringing the death toll to 282. Correspondents saw another body taken away during Thursday. Up to 150 miners remain missing. The disaster triggered a wave of anger around the country. Several unions are reportedly taking part in the 24-hour strike, and blame the privatisation of the mining sector for making working conditions more dangerous. Some 3,000 people in the capital, Ankara, marched on the labour ministry, the BBC's Turkish Service reports. In Istanbul, people tried to march to Taksim Square, the scene of last year's anti-government demonstrations, but were stopped by police. It was a second day of protest, after police clashed with crowds on Wednesday. Police fired tear gas and water cannon on some 20,000 people who took to the streets in Izmir, Turkey's third largest city situated just 120km (75 miles) from Soma. A union boss in the city was said to have been hospitalised. There were also reports of demonstrations in Bursa, Antalya, Diyarbakir and other cities. President Gul called on Turks to be "unified... to get over these hard times" during his visit to Soma. He was speaking after meeting injured miners in hospital and touring the scene of the disaster. His visit was met by protests but it was not the same level of tension that greeted the prime minister on Wednesday, the BBC's Selin Girit reports from Soma. National disasters produce lasting images, which can often change the course of a leader's time in office. US President Bill Clinton's embrace of victims of the 1995 Oklahoma bombing increased his stature, while Chinese Premier Wen Jiabao's care for the victims of the 2008 Sichuan earthquake ensured his popularity. By contrast, here in Soma, Recep Tayyip Erdogan appears to have struggled to capture the mood of an angry, mourning nation. It may be that the startling photo of an Erdogan aide (in a smart suit) kicking a protester comes to symbolise what has happened here. To government opponents, the photo encapsulates their long-held complaints - about a privileged administration which treats dissent as treason. Scuffles broke out during Prime Minister Recep Tayyip Erdogan's visit on Wednesday, as people booed him and kicked his car, calling for his resignation. However, it was Mr Erdogan's aide, Yusuf Yerkel, who made headlines on Thursday when photos emerged of him appearing to kick a protester in Soma. Later pictures of the prime minister appearing to slap a protester in a local supermarket were shown in the Turkish media. Mr Erdogan's office said that whatever happened was a "reaction of the moment", but the man in question has come forward to ask for an apology. The prime minister had been criticised for being insensitive in his reaction to the disaster, by appearing to suggest that it was a fact of life. The Soma mine was privatised in 2005. The government has been accused of rejecting a recent proposal for a parliamentary inquiry into mine accidents in the area, although officials say the Soma mine was subject to regular inspections, most recently in March. An explosion soon after midday on Tuesday sent carbon monoxide gas into the mine's tunnels and galleries, while 787 miners were underground, some 2km (1.2 miles) below the surface and 4km from the mine entrance. Many of them died of carbon monoxide poisoning. Government officials said 363 miners were rescued in the hours after the explosion, but no survivors have been brought out since dawn on Wednesday. Coal mining is a major industry in the Soma area, helping to supply a nearby lignite-fired thermal power plant, but safety has long been a concern. Nearly 40% of Turkey's electricity production depends on coal.